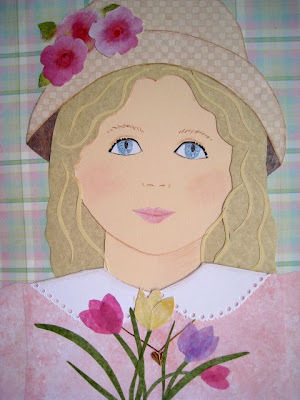 Here is a little fused fabric flower bouquet. I used some decorator fabrics and some sheers. 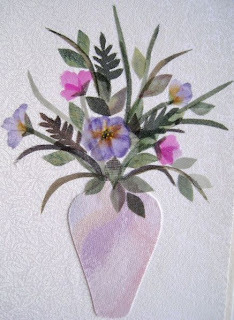 I just love cutting out delicate shapes with very sharp scissors and assembling them into a picture. Sometimes it's nice to keep things simple and leave the design with no stitching at all! I've been having a terrible time with Blogger today, struggling to post pictures and arrange the text as I wanted it! I've read about others who have also had problems with Blogger. Any suggestions for a better service? I finally decided to divide this post into two parts. As I said in my last post, I'm doing an ATC swap with my friend Janice. Here are my offerings for January and February. 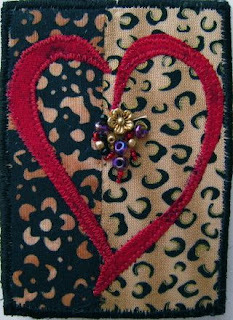 Both are done with fabric applique and the February heart has added beading. This is a great format for trying out design ideas on a very small scale!! I'm already cooking up an idea for March! 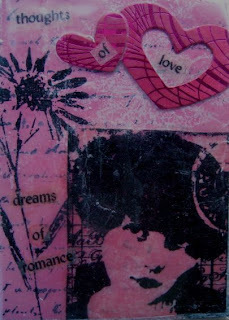 My friend Janice Reynolds suggested that we swap ATCs this year. 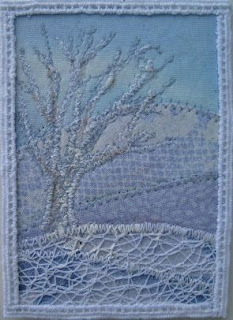 I had never made one, but loved the idea of the 2 1/2" x 3 1/2" format! We decided to create cards going back to January, and to make and swap a new one each month. Here are Janice's cards! January is called "Timeless" and February, "Valentine Wishes". 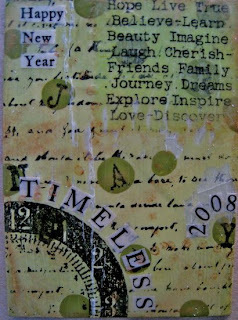 Janice applies several layers of papers, images and words, adds hand painting and stamping, and finishes with a layer of beeswax. To me, the effect is very nostalgic and rich in tone. I was delighted to receive them! and may the coming year be filled with love, success and wonderful adventures! We love you and wish we could be with you! !